Meanwhile the stylistic alternatives were continually increased for architects by other revivals. When, by mid-century, the Renaissance, and then the Baroque, returned to favor, the revival movement had come full circle: Neo-Renaissance and Neo-Baroque replaced the Neoclassical. This final phase of Romantic architecture, which dominated the years 1850-75 and lingered through 1900, is epitomized in the Paris Opera (figs. 933, 934, 935), designed by Charles Garnier (1825-1898). The Opera was the culmination of Baron Georges-Eugene Haussmann's plan to modernize Paris under Napoleon III, for it is the focal point for a series of main avenues that converge on it from all sides. Although the building was not completed until after the fall of the Second Empire, the opulence of its Beaux-Arts style typified the new Paris. The building is a masterpiece of eclecticism. The fluid curves of the Grand Staircase, for example, recall the Vestibule of the Laurentian Library (see fig. 655). The massing of the main entrance is reminiscent of Lescot's Square Court of the Louvre (see fig. 735). But the paired columns of the facade, "quoted" from Perrault's East Front of the Louvre (see fig. 814), are combined with a smaller order, in a fashion suggested by Michelangelo's Palazzo dei Conservatori (see fig. 659). The other entrance consists of a temple front. The totality consciously suggests a palace of the arts combined with a temple of the arts. The theatrical effect projects the festive air of a crowd gathering before the opening curtain. Its Neo-Baroque quality derives more from the profusion of sculpture�including Carpeaux's The Dance (see fig. 922)� and ornament than from its architectural vocabulary. The whole building looks "overdressed," its luxurious vulgarity so naive as to be disarming. It reflects the taste of the beneficiaries of the Industrial Revolution, newly rich and powerful, who saw themselves as the heirs of the old aristocracy. For a comparably extravagant display, we must turn to Sansovino's Library of St. Mark's (fig. 701), which celebrates the wealth of Venice. Small wonder, then, that magnates found the styles predating the French Revolution more appealing than Neoclassical or Neo-Gothic. Charles Garnier, (born Nov. 6, 1825, Paris�died Aug. 3, 1898, Paris), French architect of the Beaux-Arts style, famed as the creator of the Paris Opera House. He was admitted to the École des Beaux-Arts in 1842 and was awarded the Grand Prix de Rome in 1848 to study in Italy. 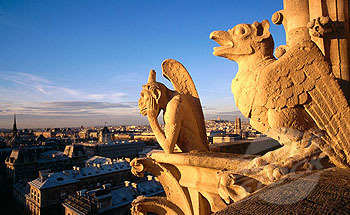 He won the 1860 competition for the new Paris Opera House. 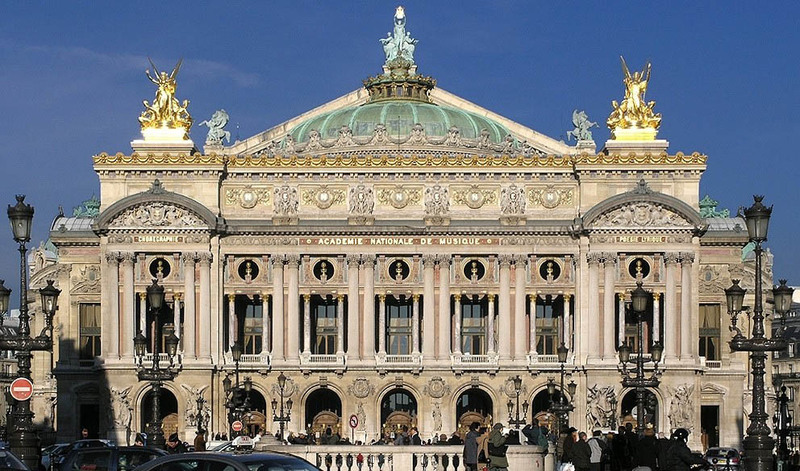 One of the most famous buildings of the century, the Opéra (completed 1875) became a symbol of Second Empire taste, and its eclectic neo-Baroque style became characteristic of late 19th-century Beaux-Arts design. Garnier�s command of the sweeping interiors was equalled by his mastery of balance, punctuation, and termination of mass and surface. Garnier also influenced the style of resort architecture for the wealthy with his small theatre for the casino of Monte-Carlo (1878), the casino and baths at Vittel, and the villas he built in Bordighera, notably his own (1872�73). Among his other works were the observatory at Nice, an apartment house, and the Hôtel du Cercle de la Librairie in Paris. For the Paris Exposition of 1889 he conceived the Exposition des Habitations Humaines, which became the subject of his book L�Habitation humaine (with A. Ammann, 1892). He also published, in 1871, Le Théâtre and, in 1876�81, Le Nouvel Opéra de Paris, a monumental description and defense of his work. The decorative arts followed much the same course as architecture during the Romantic era, but they were, if anything, more eclectic still. The revival sparked by the discoveries at Pompeii and Herculaneum reached its climax during the early nineteenth century with the Empire style, that late form of Neoclassicism which spread throughout Europe in the wake of Napoleon's conquests. As the term suggests, the style drew heavily on Roman art, which associated Napoleon with the Caesars by borrowing imperial attributes. Initially Roman prototypes had been copied more or less faithfully, but such imitations are among the least interesting products of Neoclassicism. Far more significant are the free adaptations of these sources to glorify the Bonapartes. These often incorporate Egyptian motifs to commemorate Napoleon's invasion in 1798 which opened up the Middle East. We have already caught a glimpse of the Empire style in the bed of Canova's Pauline Borghese as Venus (fig. 917). We see it at its fullest in the Chateau de Malmaison, Napoleon's private residence near Paris, which was remodeled after 1798 by the architects Charles Percier (1764-1838) and Pierre-Francois Fontaine (1762-1853). They were also entrusted with its furnishings, and their book on interior decoration, printed in 1812, set the standard for the Empire style. 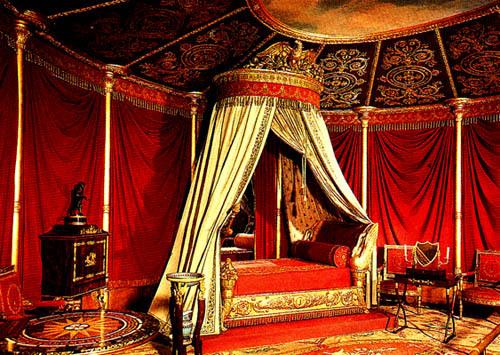 The bedroom of Napoleon's wife, Josephine, reveals her taste for the ostentatious, which was so characteristic of the Empire style as a whole (fig. 936). Thus its lavish splendor tells us a great deal about the First Empire and its ambitions. The decor here serves the same propagandistic purpose as at Versailles (see fig. 817), for this is a state bedroom. (She usually slept in an ordinary one nearby.) Although ordered previously, the remarkable bed�made by Francois-Honore Jacob-Desmalter (1770-1841), the preeminent furniture manufacturer under Napoleon, after a design by Percier and Fontaine�became the centerpiece of a total redecoration in 1810 that continues to proclaim Josephine as empress after their marriage was annulled earlier that year. It incorporates swans and cornucopias, standard Napoleonic devices, with a traditional canopy that evokes a military tent surmounted by an imperial eagle. Nearby is a tripod wash-stand, with basin and jug, based on Pompeiian examples. Like everything else about the bedroom, it adheres to archaeological fact in details. Yet nothing in antiquity looked like this, and the effect is surprisingly close to the style of Louis XVI on the eve of the French Revolution. (after a design by CHARLES PERCIER and PIERRE-FRANCOIS FONTAINE). Bedroom of Empress Josephine Bonaparte, �. 1810. The rise of the Industrial Revolution led to the debasement of the decorative arts as everything from porcelain and silverware to drapery and furniture became mass-produced to meet the needs of the rapidly expanding middle class. Despite attempts to preserve the craftsmanship of the past, the machine won out after the Revolution of 1848. This was accompanied by a corresponding decline in the standards of design, which catered to the largest possible clientele. During the Restoration and Second Empire, the decorative arts were intended to evoke the earlier glory of France through indiscriminate imitation. There were even revivals of revival styles! By 1840 furnishings began to disappear in a welter of eclectic bric-a-brac that provided an opulent setting for the new captains of industry. In consequence, only rarely did the decorative arts manage to rise above the pedestrian. 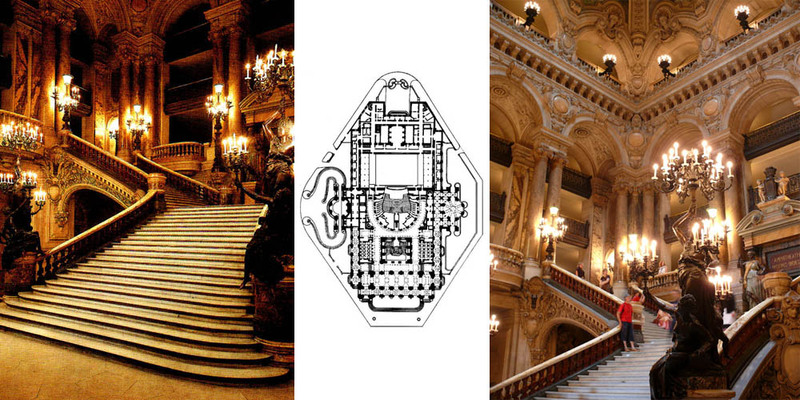 Among the few exceptions are the enormous torcheres for the Grand Staircase of the Paris Opera (see fig. 933) by the gifted sculptor Albert-Ernest Carrier-Belleuse (1824-1887). In the end, however, the only thing that could reverse the trend was another revolution in the decorative arts: the Arts and Crafts Movement.